The University, especially President Schlissel, behaved extremely inappropriately in the days following the election. What follows are his remarks, delivered the evening of November 22. I want to begin by commending everyone in attendance for braving the cold to listen to what I’m sure will be differing perspectives regarding the post-election campus climate in general and #NotMyCampus in particular. I also want to thank the Michigan Political Union for hosting this event and for inviting me to share my thoughts and insights on these important topics. It’s no secret that the progressive Left is not taking Donald Trump’s unprecedented November 8th rout of Hillary Clinton well. Since that victory, we’ve seen disturbing video of a Trump supporter beaten outside of his car on the road while onlookers yelled, “He voted Trump! Don’t vote Trump!” Another, this time a 15-year-old, was assaulted at a protest in Rockville, Maryland. The list could go on. Closer to home, I captured a scene on video for the College Fix of flared tempers, which nearly precipitated physical violence on the part of an anti-Trump woman directed toward what seemed to be a lukewarmly pro-Trump male at a University sponsored “vigil” on the Diag. There have also been at least two reported hate crimes. 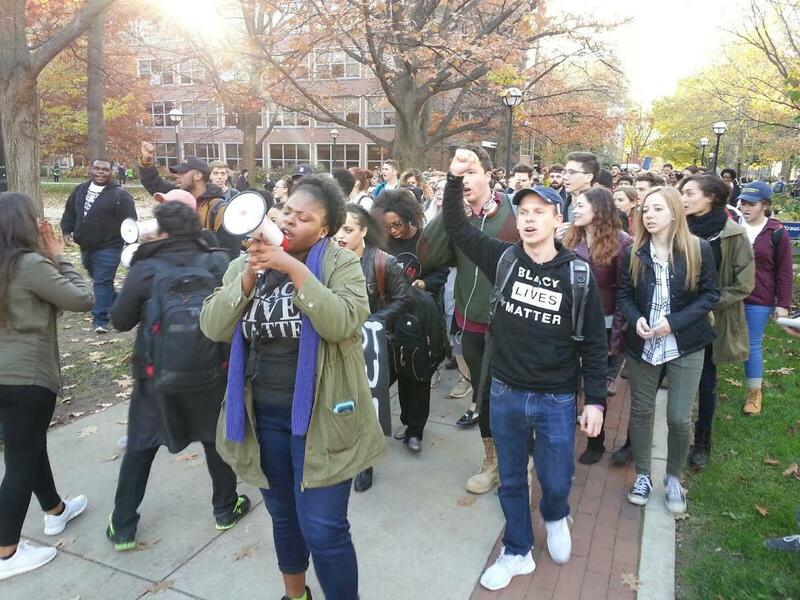 Activists staged a “walk out” last week, and one of their demands was that the University of Michigan become a quote-unquote “sanctuary campus”—a zone where federal immigration law would not apply. Obviously, the violence perpetrated by both sides is deplorable, and I condemn it, as should we all. The utter strangeness of this election cycle, however, should not rob us of our commonsense (it’s still not acceptable to hit people; we all learned that in kindergarten), or make us forget one of the mid-19th century’s most important lessons: Local authorities cannot nullify federal law. I now want to shift to focus on the University’s response. It’s no secret that Ann Arbor and the University of Michigan are liberal strongholds—though, and I kid you not, some people assure me with straight faces that that’s not the case. But this much, at least, is clear: The University behaved extremely inappropriately in the days following the election. As a paradigmatic example, President Schlissel very inclusively labelled 10% of campus as morally deficient at that vigil I mentioned. Their crime? “Standing with hate” by casting a vote for Trump-Pence. Simply put: The University’s job is to create an environment in which all voices can be heard—not just those of favored groups. It must avoid taking sides and placing its considerable institutional weight on one side of the scale. It has a duty as a place of higher learning to allow dialogue to flow where it will, even if that means things get heated and ugly. People I know personally likened Trump’s win to the onset of the “hunger games”—yes, that fictional young adult novel series that was all the rage a few years ago; you heard me right. I was also called into a Housing conduct meeting for not being sufficiently horrified at the outcome! Even further: The University, as a bastion for fearless intellectual inquiry and the pursuit of Truth, is obliged to privilege diversity of thought over other types of diversity. It sadly has not done that. If its goal was to enflame campus tensions by casting anything short of full-throated opposition to Trump as morally akin to standing by while Hitler rose to power, then they passed with flying colors! If, however, their goal was to set the stage for students to learn how to civilly interact in a pluralistic society with their co-citizens despite their differences … well, that grade’s going to look more like Orgo I scores after the first test: pretty damn low. Anti-Trump peers of mine have said that the #NotMyCampus petition is “anti-anti-Trump protests”—as though we take issue with people’s exercising their First Amendment right to gather whenever they see fit to say whatever it is they want to say, so long as it’s done peacefully. This is obviously false. The real concern #NotMyCampus attempted to flag was with the University’s blatant favoritism toward those who think the “correct” thoughts, i.e., not right-leaning folks. #NotMyCampus was about the way the University was relating to the intellectual and political diversity of its vast student body. The way the administration and various professors acted was shameful. The clear implication was that pro-Trump folks (whether the all in #MAGA-types or just those who grudgingly pulled the lever for the head of the GOP ticket in a “lesser of two evils” calculus) were somehow moral monsters. This is manifestly not the case. There were valid reasons to vote for Trump that had nothing at all to do with irrational bigotry: immigration, political correctness, trade, and foreign policy. The real issue here is with smugness. Progressives cannot believe that someone actually thinks differently than they do. As William F. Buckley Jr. once said: “Liberals claim to want to give a hearing to other views, but then are shocked and offended to discover that there are other views.” They believed that the rest of the nation shared their consensus on matters of racism, sexism, xenophobia, etc. To their downfall and eternal chagrin, they overplayed their hand and severely misjudged how much actual support existed for their practice of recreationally smearing those with whom they disagree as racists—with the linguistic equivalent of branding them with a scarlet “A.” Then they scratch their heads, befuddled, and wonder why Middle America views them with such suspicion. My hope is that this election teaches progressives that demonizing all white people, or all men, or all Christians is repugnant—not to mention horribly ineffective if your goal is to win elections. But that hope may never be realized. In the aftermath of Election 2016, the Left has been both pathetically un-self-critical and unwilling to engage in serious introspection. They seem much more content to continue taking their cues from the High Priest of Smug Liberalism, John Oliver—to be a part of a “tribe” that tars all non-members as evil, deplorable, degenerate bigots in lieu of giving actual arguments … and then pats itself on the back while laughing in unison like trained seals at the dumb rubes out in Kansas or rural Ohio. This has to stop, or we’ll continue to look on, helpless to halt and reverse the deep division of our campus—and our country.